Šid, Serbia. Holocaust Memorial. Photo: Jewish Historical Museum Belgrade. 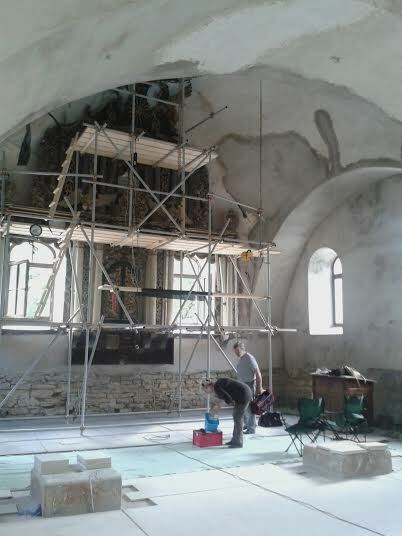 (ISJM) Summer is season of monuments, but I failed to report the creation of a new memorial in the Serbian town of Šid last winter. No Jews live in Šid now; most of the community was killed in the Holocaust. According to a report from the Jewish Historical Museum in Belgrade, local citizens led by Radovan Sremac, curator and archaeologist, recently began an effort to commemorate those victims, and this work culminated in the dedication of a marble monument on December 17, 2014. Financial help for the monument came from Israeli Association of Jews from Former Yugoslavia, and the project was undertaken under the auspices of the Šid National Library, its director Slavica Varničić, and the municipal authorities of Šid. You can read more about the dedication and see pictures here. In March, a new book, Jews of Šid written by Mr. Sremac and including research by Holocaust survivor Emil Milan Klein, who died in 2004, was published documenting the history and destruction of the community. Serbia, like the rest of the former Soviet Yugoslavia, was known for a series of magnificent modern expressive monuments erected during the years of rule by Josip Broz Tito, commemorating anti-fascist partisans and martyrs. Many of these sites have fallen into disrepair. Few monuments, however, then or now deal specifically with the fate of the Jewish communities of the region. The Burning Menorah sculpture by Nandor Glid was installed in Belgrade in 1990 as a memorial to the approximately 9,000 of the city's Jews who were murdered in Belgrade or deported to their deaths. There is also a monument in Novi Sad near the Danube commemorating the 1,246 citizens – men, women, and children – murdered by combined Hungarian gendarmerie and army on January 23, 1942. In 2006 a commemorative plaque was installed in Belgrade at the site of the former deportation and death camp "Topovske Supe," the first transit camp set up in Serbia by Nazis and their Serbian collaborators in August 1941, and where thousands of Jews were murdered. That modest memorial is in the form of a bronze Torah scroll, and inscribed on the scroll is a brief history of the camp, in Serbian, Hebrew and English (photos here). Every day Jewish men detained at the camp were taken by their German captors to be shot. Many of these victims were taken to Jabuka, a village near Pancevo, where a large monument to "fallen fighters and victims of fascism" is dedicated. Jabuka was also the place of execution of many Jews brought from Belgrade's Sajmiste concentration Camp, too. In 2013 the future of the Topovske Supe site was debated, as plans for a shopping mall by a developer were presented and these received international attention. In the end, widespread opposition to the plan seems to have put an end to this project, but it will be important to keep an eye on this site and others like it in the region to ensure respectful protection, preservation and commemoration. The Jewish community of Serbia and Montenegro has advocated for many years that more Jewish heritage and Holocaust-related sites be marked. Detailed surveys and planning for Jewish heritage and Holocaust-related sites in Serbia (as has been done in Slovenia and Bosnia) began more than a decade ago, but need updating and promotion. 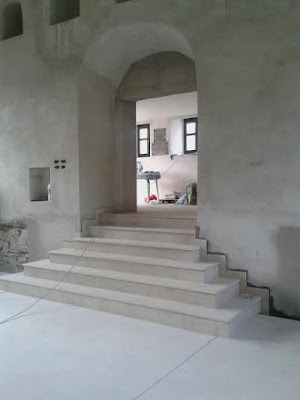 A summary list of sites in Serbia can be found here at jewish-heritage-europe.eu. The most important Holocaust Memorial site in the former Yugoslavia is the Jasenovic Concentration Camp in Croatia. That site was established by the Croatian Ustaša regime (the so-called Independent State of Croatia) and is infamous as the place of death of large numbers of ethnic Serbs, Jews, and Roma, as well as Croatian anti-fascists. The site was restored and renovated from 1995 to 2004, following the destructive Balkan Wars. There was talk of strengthening the narrative about and commemoration of the Jewish victims at Jasenovic, most of whom came from Serbia, but critics tell me that the new presentation actually lessens the presentation of the barbarities inflicted on Serbs, Jews, Roma and other victims. (Readers take note - if you have been to Jasenovic and would like to report back, let me know). A Holocaust Memorial Museum was opened in Skopje, Republic of Macedonia in 2011. There are still active Jewish communities in many of the larger cities of the former Yugoslavia, and there are Jewish or synagogue museums of various types in Belgrade (Serbia), Sarajevo (Bosnia) and Dubrovnik (Croatia) and elsewhere. Since the dissolution of Yugoslavia, however, the strength of the Jewish community in the region has been greatly diminished, as the community was forced to splinter and divide its limited financial and human resources. While the Jewish communities of the former Yugoslavia try to maintain a cooperative relationship, each small community is increasingly engaged in its own local affairs. This means, too, that there is no longer a consistent regional program for the protection and preservation of Jewish heritage sites, and the commemoration of Jewish communities. Iasi, Romania. Great Synagogue. Exterior restoration complete. Photo: Dan Trandafir 2015. (ISJM) Last year I wrote about the start of restoration of the Great Synagogue at Iasi, Romania, where work has been stalled for many years. Scaffolding has been on the building but no work took place. Happily all that has changed in the past year. Inclusion of the synagogue on the World Monuments Fund Watch List helped stimulate renewed government involvement and also brought some outside funding. 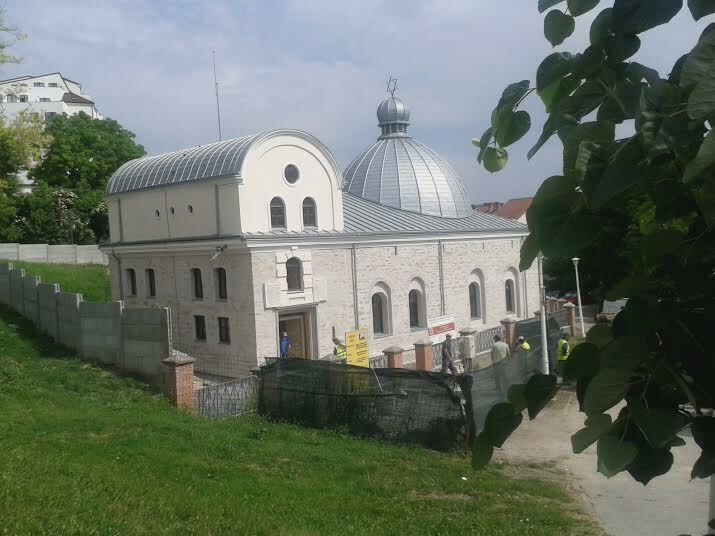 Architect Lucia Apostol of the Federation of the Romanian Jewish Communities, who has been unwavering in her advocacy for the project recently sent new photos of the building - and the scaffolding is now down. The roof and exterior restoration are complete and work continues inside. 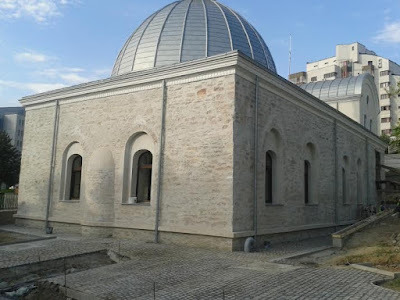 The dome, which is a much later addition to the 17th-century building, and the barrel vault over the vestibule or narthex, have also been given a new exterior surfaces. It appears that the decision was taken to leave the stonework exposed on the main part of the structure's exterior. Most likely, however, these walls would have been plastered when the synagogue was built in the 17th century. You can see an older undated photo of the synagogue with exterior plaster intact here. One aspect of the building worth noting - and now clearly visible - is the slight apse-like protrusion on the exterior of the Ark wall. Variants of this unusual feature, which allows greater depth to the Ark cabinet, is not entirely unknown in synagogue design. Similar Ark protrusions can be found in the 16th and 17th century synagogues of Venice, and later examples are known elsewhere. Iasi, Romania. Great Synagogue. 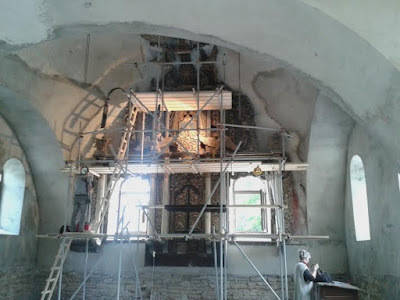 Interior restoration. Photo: Dan Trandafir 2015. Pakruojis, Lithiania. Wooden Synagogue. 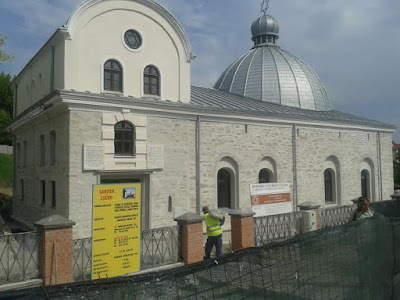 The municipality which will restore the synagogue which was damaged by fire in 2009 for use as a library. Support for the project comes from the European Economic Area and the Norwegian Financial Mechanism. Last month a new international Commission for the Issues Concerning the Jewish History and Culture, had its first meeting in Vilnius, Lithuania. This was an event that many advocates and activists for the protection and preservation of Jewish cultural heritage in Lithuania hope will help quicken erratic and often slow government and NGO commitment to and participation in programs and projects to document, protect, and present Jewish cemeteries, Holocaust related sites, and former synagogues. Full disclosure: I've been named a member of the Commission and my name was listed in the Lithuanian legislation that established the Commission last January. The position is unpaid, and for now I will be participating based on my experience and my well-known priorities, and representing the International Survey of Jewish Monuments. For personal reasons, however, I was unable to travel to Vilnius for the inaugural meeting. "headed by Alminas Mačiulis, Chancellor of the Government, [and] will examine issues related to the Lithuanian Jewish cultural and historical heritage, preservation of the Jewish cemetery and Jewish mass graves in Lithuania, other issues of Lithuanian Jewish culture and history and put forward proposals to the Government as regards the implementation of the tasks assigned. The Commission will involve not only Lithuanian public institutions and organizations, but also American and international Jewish organizations, as well as Lithuanian Jews (Litvak) community." That is a pretty open-ended agenda, and it remains to be seen how Commission members will prioritize the long list of concerns about broad issues and specific places. though my own immediate concerns are for the renewed application of effort to protect and preserve cemeteries in accordance with their historic boundaries; to retrieve stolen gravestones; and to provide informative and truthful on-site and online narratives and documentation about destroyed Jewish communities and their fate, including the marking of surviving damaged or re-purposed religious and institutional buildings and when practical and affordable, the conservation of these buildings with Jewish identity and when possible Jewish use. I look forward, too, in better linking these efforts to related work on Lithuanian-Jewish heritage abroad, such as the ongoing LostShulMural Project in Burlington, Vermont, which is contributing to our understanding of Lithuanian Jewish art and artists, and immigrant connections with the "Old Country." Other Commission members have particular expertise in other areas, including property restitution and Holocaust Education, both areas where according to many involved, progress has slowed. Additionally, I hope that much more will be done to foster recognition and respect of the small number of Holocaust survivors, including Resistance fighters, still in Lithuania, and to integrate concern for the Jewish heritage into national cultural heritage protection policies and priorities. Some communal property restitution issues have been resolved; for better or worse. Years of negotiation led in 2011 to a $53 million dollar settlement form the government, establishing a fund to be administered for Jewish communal and cultural purposes. In 2011, Rabbi Andy Baker, who is a founding member of the new Commission, wrote of the difficulties in obtaining any type of financial commitment and that in the end, activists and Jewish leaders settled for the best deal they thought they would ever get. The 2011 law certainly stimulated the formation of the new Commission. Most of the settlement the money is still forthcoming, and the research and deliberations of the Commission will effect the spending priorities for these funds years to come. “The Foundation for Disposal of Good Will Compensation for the Immovable Property of Jewish Religious Communities” was established at the end of 2011, after the Government of Lithuania had passed the Law on “Good Will Compensation for the Immovable Property of Jewish Religious Community." Subsequently, The Good Will Foundation was formed by the Foundation for Lithuanian Jewish Heritage, which is a partnership between the Jewish Community of Lithuania and the World Jewish Restitution Organization. The Foundation will review project applications and administer funds. You can read more here. Kalvarija, Lithuania. Like many Jewish cemeteries in Lithuania, the recognized boundaries of the cemetery are much smaller than the real area, which lies open for development or other uses. Photo: Ruth Ellen Gruber 2006. After the fall of Communism Lithuania was quick out of the box with programs to identify and protect Jewish sites. Under the leadership of the late Joseph Levinson, cemeteries and mass grave sites were identified and marked. Levinson published his important The Book of Sorrow identifying these sites. More recently, the Vilnius Academy of Arts in partnership with the Center of Jewish Art at the Hebrew University in Jerusalem researched and published the two-volume Synagogues in Lithuania: A Catalogue (Vilnius: Vilnius Academy of Arts Press, 2010/2012). In my opinion, this is the best and most comprehensive catalog of surviving synagogue buildings yet produced in any country, anywhere. A large assemblage of research and funding organizations partnered in the ambitious multi-year project. These two works will certainly continue to be the foundation of future efforts to choose those places for investment and intervention - whether for commemorative, education, or economic reasons. “Lithuania is proud of its rich history and abundant cultural heritage. I can assure you that it is very important for us to renovate the Jewish heritage sites and adapt them to the needs of the society. We must tend to these matters together: the Government, municipalities, the Lithuanian Jewish community as well as the local communities,” said the Chancellor of the Government A. Mačiulis. During the meeting, members of the Commission discussed issues concerning the identification and preservation of the Jewish heritage in Lithuania, protection and preservation of the Jewish cemeteries and mass killing sites, the place of the culture and history of Lithuanian Jews and other related questions. Members of the Commission agreed to formulate an action plan for the legal registration and relevant documentation of the Jewish cemeteries and mass killing sites. It was also decided to follow the action plan and preserve, manage and adapt to the needs of the society the Jewish cultural heritage sites, as well as to provide access for the society to the archival documents, and to keep compiling the list of the Jewish cemeteries and Holocaust mass graves. The Commission agreed that the long history of Lithuanian Jews and their rich culture should be fully represented in the educational plans and measures. 1. The long term protection and preservation of Jewish cemeteries and mass graves of Holocaust victims must be assured. Not all the sites of mass murder are clearly identified and properly memorialized. Many Jewish cemeteries are also uncared for and unprotected. Government authorities proposed a series of steps to address the registration, documentation and preservation of these sites, noting the legal obligations of municipalities. A working group will be created to follow through on this. 2. The Jewish heritage in Lithuania encompasses buildings notably synagogues, books, newspapers and other archival documents, Torah scrolls and other ritual objects. They represent the shared cultural patrimony of Lithuania and world Jewry. Today’s discussions focused on specific plans underway to restore a number of synagogues and other places of Jewish heritage, noting the importance of including information on Jewish life and history. The conversation also highlighted the cooperative program underway between YIVO and the Lithuanian National Library and State Archives. 3. Members of the joint commission agreed that more must be done to teach Lithuanian children about the history of Lithuanian Jewry, including its contribution to Lithuania and to world Jewish thought, and also about the Holocaust in Lithuania. This will entail a thorough examination of the current school curricula and textbooks as well as other activities such as school visits to museums and historical sites. 4. Jewish representatives pointed out that there are significant gaps in Lithuanian law on private property restitution and its subsequent implementation that have precluded some number of Jewish Holocaust survivors and their heirs from being able to file property claims or to have them successfully addressed because of residency or citizenship requirements at the time. At today’s meeting it was agreed that a more thorough examination of this problem will be undertaken with the goal of determining what appropriate remedies might be taken to address it. In the months to come I will make a point of more regularly reporting on Jewish heritage issues from Lithuania and I hope that I'll have a chance to visit there soon. Meanwhile, I encourage readers with expereicne in Lithuania to share there thoughts with me as comments or privately, and to alert me to particular area of concern - either specific sites or broad issues - that will benefit from public discussion and attention, and that may need to be addressed by the Commission.